Grilling isn’t a seasonal thing. Most of us cook outdoors year-round. The only thing that puts a damper on grilling is rain — and it has been pouring in Texas this spring. Maybe you should take this time to think about Wolf grill maintenance before you start planning your menu for a Memorial Day cookout. If you have a Wolf grill, you’re probably the type to put a foodie spin on the standard cookout menu. Get your grill ready for summer or hire C&W Appliance Service to do the dirty work and then check out the recipe below for a tasty twist on the regular burger. See what’s cooking: Wolf features halogen lights inside the grill. To replace them, unplug the grill, use a screwdriver to press the retaining bracket and pull out the old bulb. Hold the new halogen bulb with a paper towel, insert it into the socket, and then replace the cover lens. Clean the crud: Close the lid and turn the sear and other burners on HI for 10 to 12 minutes then turn everything off and allow the grill to cool completely. Remove the grates and briquette trays. Cover the infrared sear and other burners with plastic wrap to protect them from cleaning solutions. Spray the interior with oven cleaner and proceed according to directions. Remove the plastic wrap when done. Get stainless steel burner grates looking great: When the grill is still hot after cooking, dip a grill brush in water repeatedly while you scrub the hot burner grates. The steam generated will help loosen food particles. Use a mitt to protect your hands. NEVER clean the burner grate while it’s over the infrared sear burner and don’t allow liquid to drip on hot ceramic tiles or you may damage them. 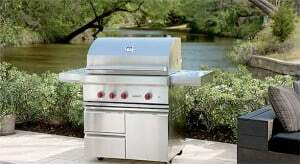 De-bug grill burners: Inspect these for nesting spiders and insects once a year and/or at least once a month. They can cause the gas to flow from the front of the burner and cause a fire behind the valve panel, damaging the grill. Signs to look for include a grill that does not reach the proper temperature or heats unevenly, yellow flames or the smell of gas. Empty the smoker box: Remove and wash with mild detergent. Dust debris from ceramic briquettes and tray: High heat will usually burn off debris from briquettes. Occasionally, you may need to remove the tray when it’s cool and wipe clean. Extinguish potential grease fires before they start: When the grill is cool, slide out the grill drip tray and wipe it clean to avoid grease fires. Place cream cheese in a food processor and puree until smooth, scraping the sides and blade often. Add caramelized onions, mayo, blue cheese, thyme and black pepper. Pulse until well incorporated, scraping often. Season with salt to taste. Serve burgers with blue cheese spread – add bacon, lettuce and tomato as desired. Makes four burgers. Enjoy!